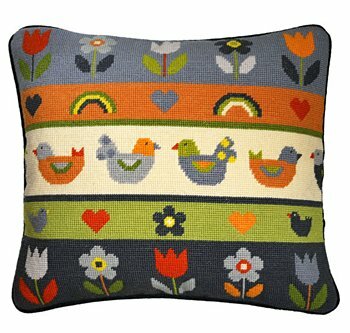 The table below is a general guide for the common types of needlepoint fiber and the best canvas size to use them on. 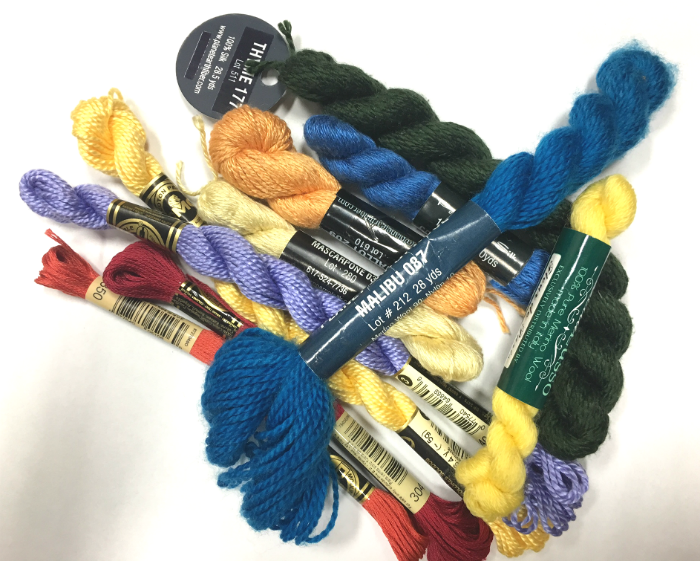 We recommend you use this as a guide and test the fiber on your canvas to make sure it gives you the look and stitching experience you want. Tapestry Yarn. Tightly twisted 4-ply that cannot be stripped/thinned. Common brands are DMC, Anchor and Appleton's and it usually says tapestry yarn on the label. 10 or 12 count. Use it as it comes. Persian Yarn. Loosely twisted 3-ply that can be stripped into its individual ply. Common brands are Waverly, Paternayan, Colonial. 10-12 count use all 3 ply. 13-14 count use 2 ply. 16-18 count use 1 or 2 ply. Crewel Yarn. A light weight loosely twisted wool yarn commonly used for crewel embroidery. 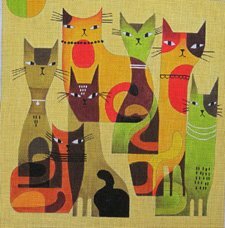 Can easily double up to use on detailed needlepoint projects and finer mesh canvases. Common brands are Appleton's, Week's Dye Works, Bucilla, Paternayan, Bella Lusso, D'Aubusson's. 16-18 count use 2 ply. Not ideal for other mesh sizes. Embroidery Floss. 6-ply cotton that can easily be stripped into the number of strands required. Common brands are DMC, Sullivans, Madeira. 10 mesh will need to thicken with an additional 2 ply. 12-14 count use all 6 ply. 18 count use 4 ply. Perle/Pearl Cotton. Loosely twisted cotton that comes in two sizes. Has a luster a little like silk. DMC is the most common brand. 13 and 14 count use Size 3. 16 and 18 count use Size 5. Planet Earth has a merino wool that is single ply for 13 and 14 mesh and is widely available. They also have a silk of similar weight and usage, and a silk called Pepperpot for 18 mesh when used single ply. There are many other varieties of silk and boutique fibers on the market. These come in various thicknesses so refer to the manufacturer's recommendations for correct application. 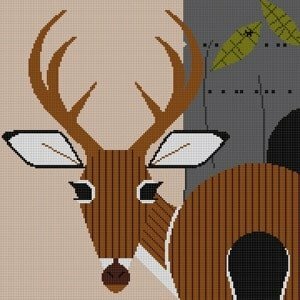 This chart is based on using a needlepoint tent stitch. 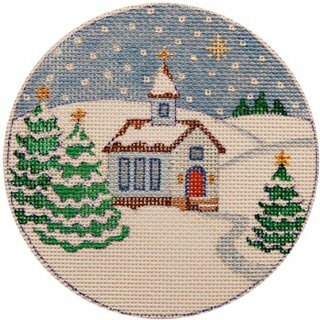 Using a cross stitch, for example, will mean you need to thin your thread or use a slightly larger canvas. Conversely, stitching a straight stitch e.g. satin stitch will generally mean you need a thicker thread to get the same coverage. 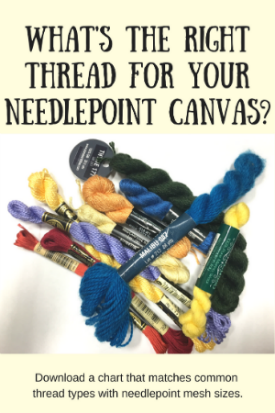 We hope this information helps you to find the right needlepoint thread for your needlepoint canvas. Click here to download a pdf of this information so you can print it out. If you have any questions be sure to contact us as we are always glad to help. You'll get exclusive content like what you've just read, you'll hear about new designs and kits as soon as we receive them, plus we run a lot of specials on popular items that only our newsletter readers hear about.